At the end of every summer, for a long week overlapping with Labor Day, our family would leave the Minneapolis suburbs and head down to stay with my bachelor farmer Uncle Fred. The first of the morning chores was popping the pin on the chicken coop and letting the chickens scatter across the yard to peck and peck until they gathered together again by dusk to be closed in again. The chickens were ancillary to the financial enterprise, however, they filled his and neighbors' need for fresh eggs (in all shades of brown and some with double yolks!) in the same natural way that his own slaughtered pig and cow filled the freezer for consumption throughout a calendar year. I realize that my first vivid imprint of where eggs came from was a pretty romantic notion. At Uncle Fred's Farm, circa 1978. 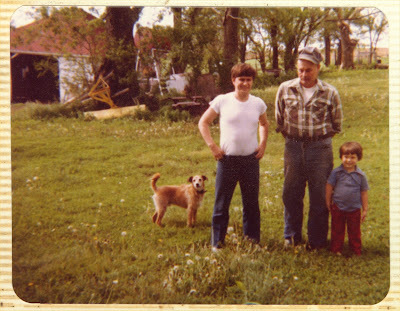 Lester (the dog), my Dad, Uncle Fred, and me. 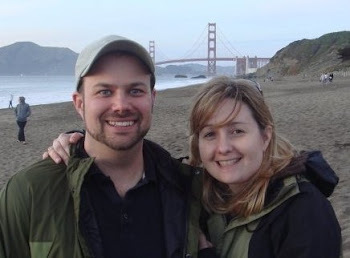 When I first tipped the the lid on the carton of eggs from Full Belly Farms I was reliving these kind memories until Lauren informed me that they were seven dollars a dozen. [queue the record scratch] Seven DOLLARS a dozen? This didn't seem to compute on several levels. First, I struggled to remember what was the highest price I had ever seen for the fanciest free-range, vegetarian fed, super omega-3 enriched eggs anywhere including the farmer's market (maybe $4.50??). Secondly, this figure was hard to reconcile with my pre-adolescent memories of the farm (weren't all those eggs basically free??). Full Belly Farm Eggs (www.fullbellyfarm.com) come in various shades of brown in a generic carton with an informational sticker on top . . . "Fresh Eggs Assorted Sizes" and no mention of grade. I admit the Full Belly Farm eggs were gorgeous hues of brown and of an approachable size that an elementary school kid could easily palm. Our CSA farmshare comes from the Capay Valley in California and we have the option of adding sustainably raised meats and eggs to our weekly distribution of fruits and vegetables. It would be easy to herald the modern virtues of Full Belly's approach to farming with their mobile chicken cabanas . . . their approach seems reminiscent of what I remember about Polyface farms if you've read Pollen's Omnivore's Dilemma. I love saving the planet as much as the next guy, but at this moment my main concern is how do these eggs TASTE? 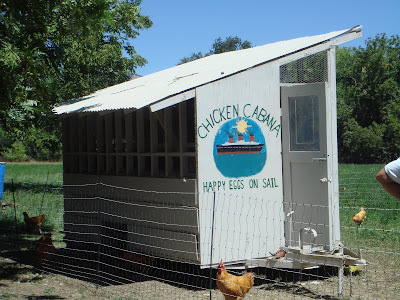 A mobile chicken coup (aka Chicken Cabana) at Full Belly Farms, photo credits to Lauren. For me the purest, most ultimate egg test is to simply fry it and let the egg speak for itself. Uncle Fred's technique was to take the cast iron skillet and first fry the bacon and then move on to the eggs (and repeat . . . for 20+ years in the same pan). My cast iron isn't nearly that seasoned so I used the Teflon. Upon cracking, the orangey yolks and high riding albumin were immediately notable. Somewhere along my Food Science education I have inserted this cartoon image of the USDA-sanctioned egg quality grades into my memory. Basically, when an egg white stands up tall around the yolk you've got a high quality and fresh egg. You'll find this and more in the USDA Egg Grading Manual, a comprehensive and authoritative 50+ pages on egg quality. In the spirit of full disclosure I did try candling the Full Belly Eggs in order to report on a few more quality parameters, however, I don't think my mag-light had the lumens required for the job. Cartoon of egg grades from the USDA Egg Grading Manual (www.ams.usda.gov/AMSv1.0/getfile?dDocName=STELDEV3004502), note the profiles. As a matter of preference I prefer my eggs--as we called them growing up--"basted". 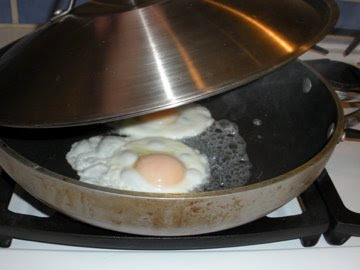 Simply start your eggs out sunny side up, add a few teaspoons of water and cover with the lid so the tops of eggs steam. The albumin covering the yolk will go from transparent to opaque, yet the yolks will remain nice and runny. These images make me hungry. 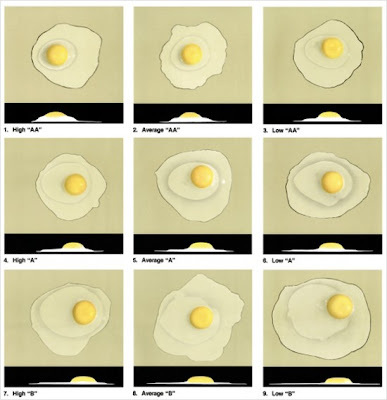 Top: basting procedure; Middle: finished eggs, top view with cracked pepper; Bottom: finished eggs, profile view trying to show the height of yolk. In my homage to Uncle Fred I complimented the eggs with bacon (in this case organic and nitrate free) and toasted white bread (the bread-bag informed me it was HFCS-free). Not sure what Uncle Fred would have thought about all that since he farmed his 180 acres without chemical fertilizers and didn't charge a premium or turn it into a business proposition . . . however, it was another time and he had paid off the farm long before I was in the picture. "Basted" eggs and bacon with toast. Unfortunately, yolk color and taste aren't in the USDA's grading scheme--I understand why, that's too intensive to measure and can become somewhat objective if you don't do it right. But, yum, these Full Belly Eggs are some of the best I've had in recent memory. Also, check out Lauren's blog post on Wouldn't That Be Lovely to see what those rich yolks did to the color of her sugar cookies. $7 a dozen? Yeah, we'll probably get them again, but $7 a dozen? I'll get over it . . . I need to get out there for your egg breakfast. Nice blog concept. I just recently heard the term "basted eggs" recently when a customer ordered them at the restaurant. I enjoy learning about the process and seeing the GREAT photographs. Makes me want to cook up an egg right now! Great blog. candling tip - toilet paper/paper towel tube and sun are the best (and cheapest) implements to use. That USDA egg grade diagram would make a cool T-shirt. Just throwin that out there. I have never heard the term basting, but I suppose I have done it before! $7/dozen? That is insane. Makes me love our six little chickens and promises for the future even more! And tell me that is NOT white bread on the finished breakfast plate. Come on you two, try homemade bread!